Snowboarding was invented in New England when Jake Carpenter snuck onto closed slopes at Stratton Mountain Ski Resort in Vermont to try out his crazy invention: a broad, flexible board that allowed a person (preferably an adventurous young person) to rocket down a slippery slope the way a surfer glides at speed on the crest of an ocean wave. 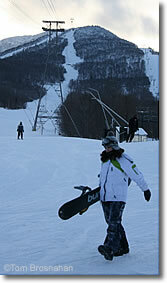 Carpenter went on to found Burton Snowboards, and Stratton Mountain Ski Resort became one of the USA's premier snowboard destinations, with important annual snowboarding races, contests and competitions. The sport was quickly adopted by other New England ski areas, so now most ski resorts in the region have at least one and often two or three terrain parks, as well as lessons for aspiring snowboarders, and shops for rentals or purchase of snowboarding equipment. The only New England ski area that excludes snowboarders is Mad River Glen, the old-fashioned ski area with a single-chair lift and no trail grooming. End of a good day at Jay Peak VT.